SMT Multilayer Ceramic Capacitors are offered in C0G dielectric. 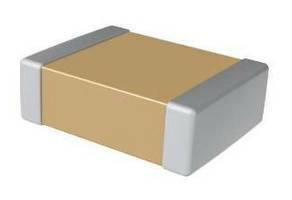 KEMET C0G surface mount multilayer ceramic capacitors carry ratings to 250 V and come in 0402 case size. Offering values up to 330 pF, these commercial- and automotive-grade products feature material that eliminates piezoelectric noise, offers minimal ESR and ESL, exhibits thermal stability, and does not produce any capacitance decay with time. Comprising commercial and automotive grades, series offers various termination finish options: matte tin, tin-lead, and gold. GREENVILLE, S.C. -- KEMET Corporation (NYSE: KEM), a leading global supplier of electronic components, today announced expansions to its commercial and automotive lines of surface mount multilayer ceramic capacitors in C0G dielectric. KEMET continues to lead the industry in C0G dielectric product development, and has now achieved the world's first 250V rated 0402 case size capacitors offering with values up to 330 picofarads (pF). In addition, capacitance offerings in EIA 0603 through 2220 case size devices have been extended by over 30%. KEMET C0G dielectric capacitors are utilized in a wide variety of applications including critical timing, tuning, decoupling, bypass, filtering, blocking, circuits requiring low loss, circuits with pulse, high current, transient voltage suppression and energy storage. The unique material used in these C0G devices eliminates piezoelectric noise, offers extremely low ESR and ESL, high thermal stability and no capacitance decay with time. Available in both commercial and automotive grades, KEMET C0G capacitors feature a variety of termination finish options including matte tin, tin-lead, and gold. For more information, please visit www.kemet.com/C0G. KEMET Corporation is a leading global supplier of electronic components. We offer our customers the broadest selection of capacitor technologies in the industry, along with an expanding range of electromechanical devices, electromagnetic compatibility solutions and supercapacitors. Our vision is to be the preferred supplier of electronic component solutions demanding the highest standards of quality, delivery and service. KEMET's common stock is listed on the NYSE under the symbol "KEM." Additional information about KEMET can be found at http://www.kemet.com.